Georgi Tomov FEFB champion 2018! As every year, the long Ascension weekend held a nice opportunity to play a chess tournament: the FEFB Individual Championship, which was held in Namur this year. Members of Europchess’s first team have been regular participants in the 12-player elite tournament, and this year it was Georgi Tomov who defended our colours.And he did so in fantastic style, winning the tournament with 5.5/7, a full point clear of the runners-up. Georgi set the tone already early on, when after a first round win against Maximilien Dallemagne (2074, Fontaine-l’Evêque), he defeated top-seed François Godart (2420, Charleroi). He followed up with draws and two further wins in rounds 4 and 7. This meant that in the end he remained the only unbeaten player and reached a Grandmaster-like performance of 2474! 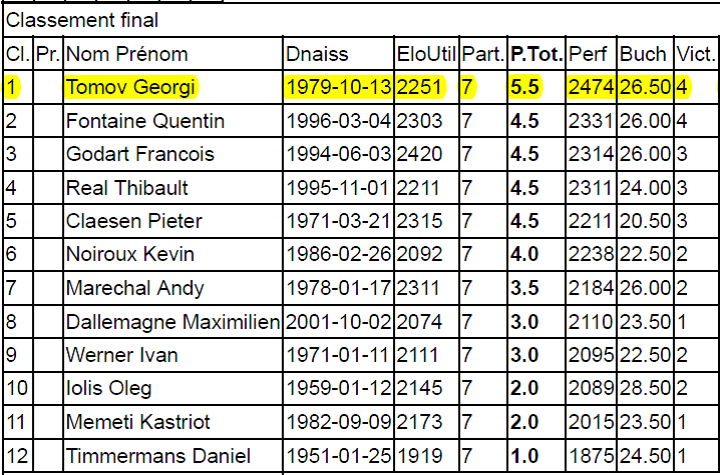 Also worth noting: Georgi won all his four games with Black! After an interesting middlegame where both sides missed chances, we reached this position. 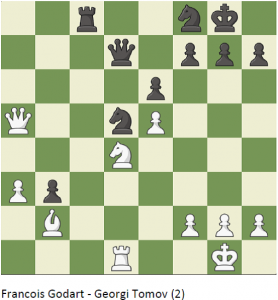 Black’s pawns look threatening, and perhaps it was most prudent to return the piece with 1. Nxg4 fxg4 2. Rxg4, when White should be able to hold a draw. Instead he decided to try to exchange Rooks. But now Black just wins the Rook with a small combination. 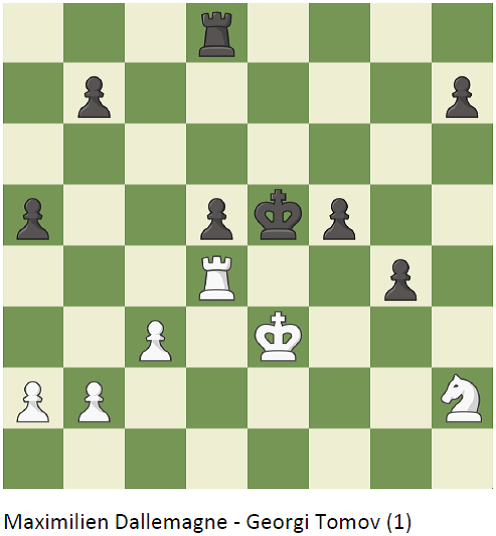 Black is slightly pressing, but White should be fine with careful play. But now White optimistically captures the pawn on b3. And, all of a sudden, Black wins with a forced sequence of moves. 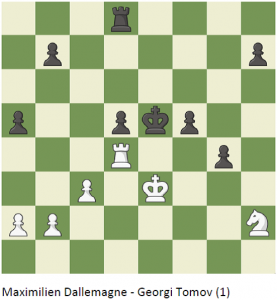 The main weakness in White’s position turns out to be the King. Three fellow Europchess members played in the Championship’s open section. Martin Müller saw some light and shadow, finishing in 7th place with 5/7. Mark Ouaki continued to achieve good results in his first season, scoring 4/7 and with 1785 a performance well above his rating. Luis Parreira though suffered a setback after his strong results so far this year, scoring only 50% against rather low-rated opponents. The winner of the open tournament was one of the Elo favourites, the experienced Claudio Piacentini (2112, Charleroi) with impressive 6.5/7.